range. A stunning handmade table finished in a rich dark hint of mahagony, shaped, and robust with its gorgeous looks it will create a truly stylish touch to your home. 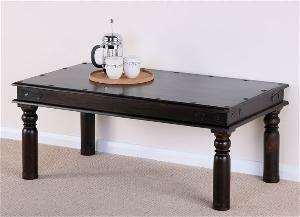 Features of this range are colonial style shaping to the legs with rustic Iron detailing and studding to the table top. Metal bracework spanning the legs with a hand sealed bees wax finish. Please note that to avoid damage in carriage the 70mm hardwood legs will come unassembled. However these are not just bolt together legs. They are individually handcrafted using a traditional Indian joint. (very simple to assemble). This item has a rustic finish. Ace Craftique is manufacturer products according to customer secification.